How about the Trading Fees?Generally, the charges are the same for both accounts. Whereby, the normal brokerage fee is 0.42% per transaction with minimum RM12 for online transaction or minimum RM40 for offline transaction. Meanwhile, the clearing fee is 0.03% per transaction and stamp duty of RM1 per RM1,000 contract value. For those account which gave you some trading limit based on how much collateral you pledged into your trading account. Collateral such as cash and shares would give you a limit of 2-3 times of the total value pledged. This is good for those traders who want some flexibility, so that he/she still can buy shares although he/she don't has so much cash inside their trading account yet. Of course, investors need to settle the outstanding amount within T+3 trading days. 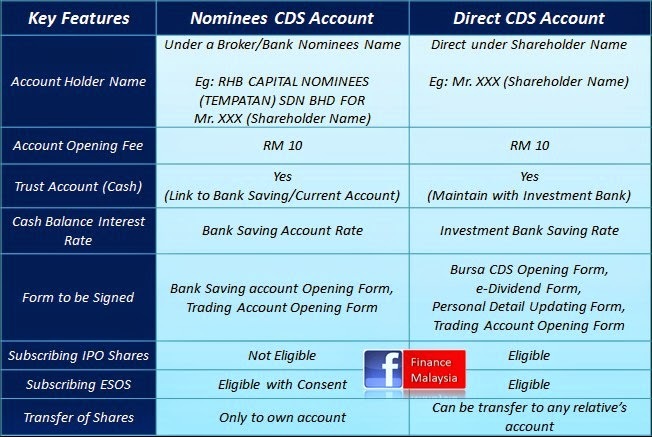 By comparing both account, share investor who owns a Direct Account can enjoy better savings on the "after trading" charges. However ,the main advantage that a Nominees Account holder can enjoy is the service of a share broker. The paperwork of corporate actions sometimes is very hard for investors to understand and make decision. And, many investors might missed out in replying those corporate actions if they were a direct account holder. If you're a nominee account holder, please make full use of your nominee charges. In summary, there is advantages and disadvantages to both accounts. 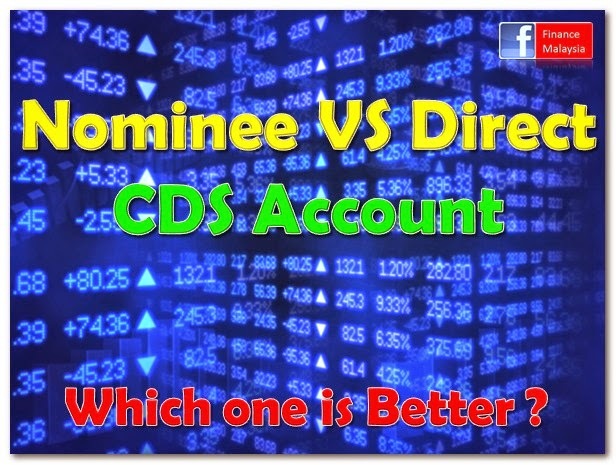 PS: All Margin/Pledge /Foreign Trading accounts are treated as Nominees CDS account. Thanks for sharing the important information especially to new investor like me. 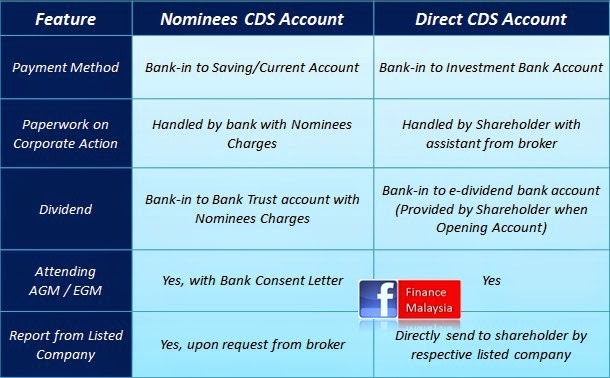 I'm going to open Direct CDS account soon with maybank as I already have saving account there. For the paperwork on corporate action, could you give me some example & details what thing that I have to do.. thanks. Hi, good to hear that. For corporate exercises such as rights issue, direct CDS account holders have to submit back the relevant forms with payment after receiving the letter directly from that particular listed company. Thanks. 75a11b298Here are best materials for you!